Some backpackers like to wake up and hit the trail without cooking up a pot of oatmeal. It’s easy to cook and dehydrate oatmeal at home and turn it into oat bark. Oat bark is crispy, but still chewy. While you’re chewing it, the flavor of the fruit you added to it releases onto your taste buds. It’s the equivalent of a bowl of oatmeal that you can nibble on while you knock-out your first mile. 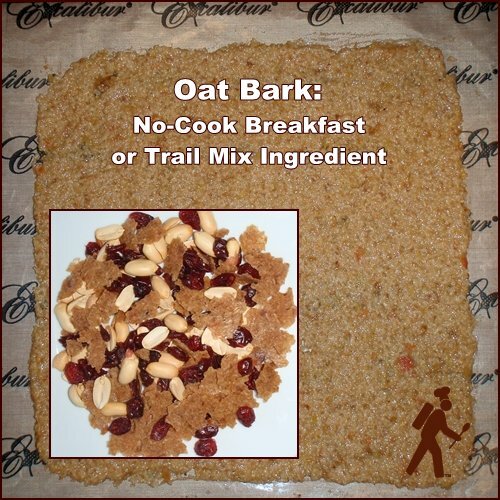 Oat bark also makes a tasty ingredient in trail mix with the simple addition of nuts and dried fruit of choice. Some chocolate pieces would certainly round out the mix. Combine all ingredients in pot and bring to boil for two minutes. Reduce heat to simmer for five more minutes and then turn off stove. Let pot sit covered for ten minutes. Allow oatmeal to cool and then run through a blender until smooth. Spread thinly on dehydrator tray covered with non-stick sheet. Dehydrate at 135° F for approximately eight hours. After six hours, the bark should be dry enough to flip over and finish drying without the non-stick sheet. Break dried oat bark into pieces and store in a jar with tight fitting lid until ready to pack. This recipe yields 1½ cups of oat bark which would be one large serving of oatmeal or could be divided up and added to trail mix recipes. If desired, oat bark can be turned back into oatmeal on the trail with an equal quantity of boiled water and a little vigorous stirring. Variation: Works well with a banana instead of an apple. I used sugar in place of maple syrup, omitted the raisins, and added a tablespoon of fresh lemon juice. Reply to this email with a trail mix recipe. Whatever ingredients you like to combine in a bag and munch on. I’ll pick one winner randomly from those who reply by January 10th. The prize will be my book, Recipes for Adventure, print edition. Click to view the new backpacking recipes. We’ve assembled over 50 shared recipes from readers. Thank you! If you are on Facebook, come on over and like the page. We're closing in on 1000 "likes." I do a lot of contests and frequent posts about our favorite topic… good eating on the trail! Click to visit BackpackingChef on Facebook. Dominique and I wish you all the best this Christmas season and a Happy & Adventurous New Year. The smell of Dominique’s traditional Swiss cookies is flowing through the flat as I finish this newsletter. I am heading to the kitchen now.